My Nokia N9: What does the PR 1.2 for N9 changelog include? folders on the "Home Screen"
1 Folders. To rename a folder press and hold inside the created folder to see a space to type the name. 2 Default font changed. Including height and weight. 3 Contact Book has the 'Search' bar visible by default. 4 Each Contact Book entry now has wording "Synct to - MFE - <email address>". This isnt 'clickable' and seems odd as it takes up quite a bit of space without clear functionality. 5 IM Availability screen has been changed. It is now dark themed. 6 Searching for contacts has been optimised and now allows you to search in Skype from the same screen. 7 Swype keyboard now has bigger keys. Cant emphasise how great of an update this is. Also they seem to have fixed the "P" bug in swype. Previously starting a word with P in swype resulted in the keyboard being swiped. This no longer happens. 8 Turning off the device causes the LED to stay on. Once it goes off the device can be turned on again. 9 All UI menus have changed from white grey to black grey. 10 Support for D-Pad arrows. 1 LED now 'breathes' when the device is being charged. 2 Facebook/Twitter notifications on the home screen. 3 Swiping down to close an app now results in a dark shadow being cast on the open window. I suppose this is to indicate the swipe will close the app? Nice touch. 4 Closing an app no longer results in the app appearing in the multi tasking window for a split second before closing. 5 Disable Backgound connection for mobile data connection (ie. if you want to allow only WLAN to be used for bg connection). 1 Copy and paste in the Browser. 3 Opening and closing a link from a browser sends you back to the original page as oppose to the multi tasking window. 4 Some new Wallpapers inserted in Gallery? 6 More image editing options in the Gallery. 7 Selecting multiple files in the image gallery causes a purple haze to appear over the images. Previously only a purple outline was used. 8 Music. Now you can delete a music file straight from the media player. 1 Email. The words "up-to-date" now appear when a mailbox has been synced in the last 1 minute. 3 Email. A failure to sync an inbox now shows a red arrow on the notification bar. 1 Improved scrolling in most apps. Including the Ovi/Nokia Market. Though lag still appears unexpectedly. 2 Drive. The Drive App now has imported all the Favourites from the Maps application. Also the panning/zooming is much smoother. I also note that street names now re-flow with you to ensure you can always see the street names. 1 Twitter. Still unable to retweet in the official app. 2 Facebook App still missing "Groups". 3 After editing a photo it still takes a while for the "Share" button to appear for that particular image. 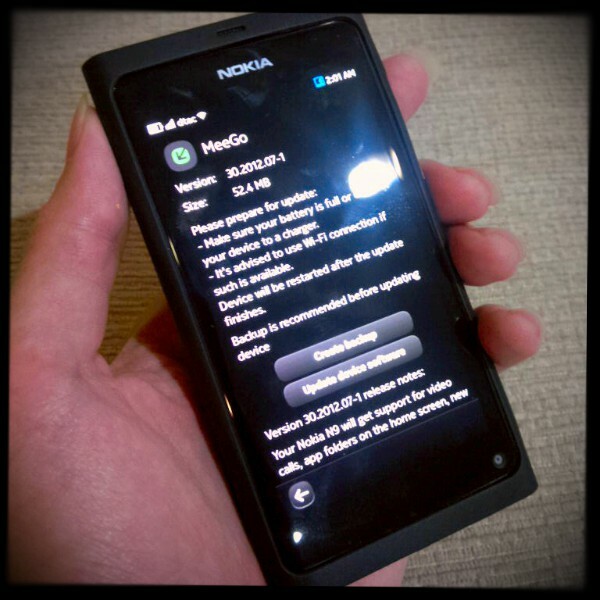 What improvements have changed the way you use your N9? what's left to do? Retweeting worked always fine for me. yeah confirmed available 1.2 in Australia! Update no problem and generally better however does anyone know if the old 'make Twitter work' workaround is still valid as since update 'Accounts' looses Twitter after turning phone off and doesn't seem to work correctly either. Or is this just a bad install? wrong. it's a micro-B. So you'll need adapters. BUT still can be supported. Don't over-use the word 'ever', okay? I might be late on this, but retweeting not working either with my N9.